Like an ancient forest — where the subtle play of light, texture and shadows results from a process measured in centuries and inches — things of lasting value develop gradually, at their own pace. The ability to learn from experience — one of humanity’s greatest treasures — implies constant yet very gradual progress. The combination of stillness within and determination without are the essence of this process. 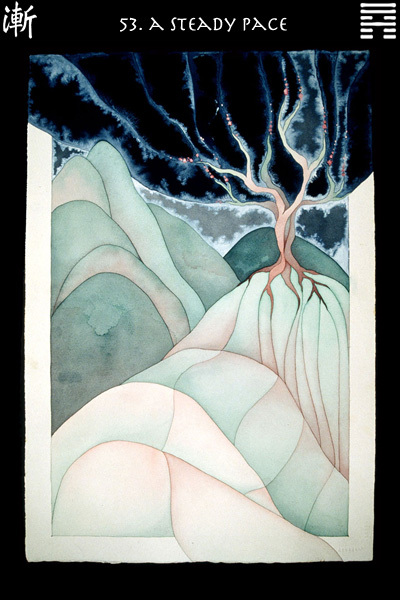 Good things can sprout quickly, but the truly delightful take much longer, like a beautiful tree on a mountainside. The principle of gradual development also applies to relationships. For love, marriage, and other long-term partnerships, the best progress is slow but steady — slow enough to allow for the bonds to knit properly and steady enough to keep moving in the right direction. A firmly rooted tree has dignity. And, because its roots penetrate deep beneath the soil, it is not easily toppled. Steady development of your depths is what makes sustainable long-term progress possible. You can’t expect to have everything all at once. Development must be free to take its course; events must neither be rushed nor manipulated, but allowed to unfold in their own natural time. In this way, you will achieve and enjoy long-lasting relationships, as well as success in the world. The image is of a lonely young man who sets forth on his own. His perception of facing a huge challenge makes him careful. The indication here is that if you are cautious, and persevere, you will have good fortune. When situations are allowed to develop gradually with good timing, liabilities can evolve into assets. You reach a point of rest and safety, which is an initial level of success. The way ahead appears clear and bright. It is right to feel pleased about your progress. The timing is ideal for expansion now, especially in the area of relationships. Have you ever soared too far, too high, and found yourself in a difficult or hostile situation? Perhaps even lost your way? Sometimes we don’t let things develop quietly, but forge ahead rashly to find ourselves suddenly caught up in a struggle. In such cases, the first requirement is to slow down -- or climb down -- very carefully. When you find yourself in an awkward position, even if through no fault of your own, find a safe place to land, and regain your balance. When tumbling through the air, it helps to find a net. Quickly. And then rest there awhile before getting back on the tightrope. Don’t worry. You will find your balance again. When moving rapidly toward the heights, it’s common to separate from old friends and past associates -- even partners sometimes. Naturally, in such circumstances, you feel a bit lonely, but periods of isolation and withdrawal are unavoidable in the process of self-development, as a kind of social sleep that makes reawakening possible. Even though a period of withdrawal from others can complicate your life for this period of time, you must move through such times with patience, rather than ignore your needs for privacy and concentration. Misunderstandings will become resolved over time and reconciliation with important others will be achieved. When gradual development reaches its climax, supreme good fortune results and a great example is set for others. Be true to your goals; even though they may seem selfish to others, your success in achieving them will bring value to the lives of those around you.